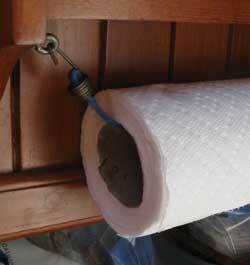 Aboard Que Tal, one of the previous owners had installed a beautiful teak spice rack and paper towel holder. It had two failings: being over the stove and next to the ceiling, any spices stored in it quickly lost their flavor from the heat. And since it was next to a port hole that I always left open, any little breeze would spin the roll on the dowel and I'd instantly have 10 feet of paper-towel flag blowing in the breeze - sometimes even threatening to stream right out the companionway. The thing is, a similar teak rack now costs over $100 - hardly cheap for something that really doesn't really work. 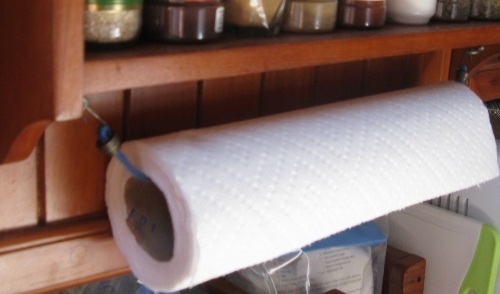 I put my spices in a small cupboard near the floor and cursed the paper towel streamer - but never came up with a better way of storing the roll. Fast-forward to cruising aboard Winterlude with our friends David and Jan Irons, who writes Commuter CRUISER.com. Jan swears that I gave her the idea for her paper towel holder, and I'm equally certain I didn't because I would have quickly retrofitted my holder. Regardless, it's the best solution I've ever seen. And making it even better is the fact that it costs less than $5. You can use a pre-made bungee with hooks on the ends, or custom-make one yourself to the exact length you need and make loops in the ends using hog rings. Quarter-inch shock cord provides the right amount of tension. You'll need to replace the shock cord about once a year. While Jan put hers under an existing spice rack, you can put it anywhere that you can screw the cup hooks into. Very simply, the shock cord presses the roll of paper towels against the wall and keeps it from spinning in the breeze - but it's still easy enough to pull off a sheet when you want it. The photo at right shows the system close up.